Goose Down Ranch is a relaxing ranch setting with cabins for rent and coordination services. The Grizzly cabin is a 2 bedroom loft cabin in log style. Full kitchen, laundry facility, BBQ decks, wildlife viewing and more. The Timber Wolf cabin is all one level 2 bedrooms, full kitchen, laundry and all the amenities, including TV/VCR and more. Both cabins are located less than 1 mile from the Beaverhead River and a short distance from the Big Hole, Madison and Ruby rivers. Wildlife viewing, fishing and hunting are all available. Directions: Goose Down Ranch is located off I-15, 60 miles south of Butte off I-15, 110 miles north of Idaho Falls. 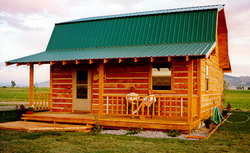 Cabins are 4 miles south of Dillon off Highway 91 south on Carrigan Lane - 1 mile from the Beaverhead River.